Are you a volunteer, mentor, teacher, friend, or refugee that is interested in learning what it takes for an English Language Learner to access higher education and increase opportunities for career and financial success in America? Would you like to understand realistic goal setting and timelines of achieving important new skills, trainings, and certifications- all while trying to learn a new language? 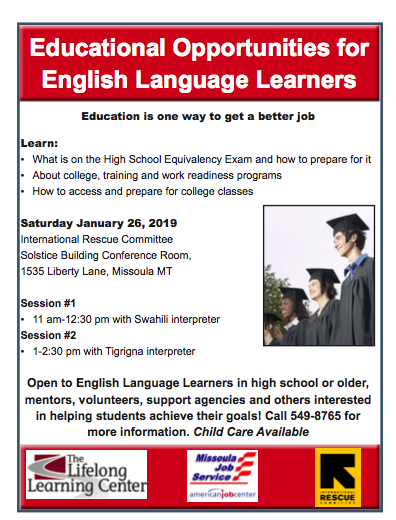 Whether you would like information about how to earn a high school equivalency diploma (HiSET), transition from graduating from high school to higher education, or how to help guide a friend through this long process, head to the International Rescue Committee office on Saturday, January 26th. All are welcome. Sessions will be translated into Swahili and Tigrinya. Childcare will be available. For more information check out the flyer below!